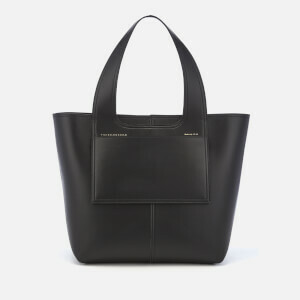 Boxy and structured with sturdy flat handles, the ‘Apron’ tote bag from Victoria Beckham features an external apron-style pocket adorned with discreet gold foil branding. 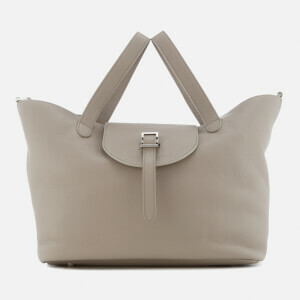 Unzipped at the top, the smooth leather bag opens to reveal a spacious interior complete with a large zip pocket within. Designed with a centre seam detail and tonal exposed stitching throughout. Protective dust bag included. Dimensions: H: 33cm x W: 49cm x D: 17cm. Handle Drop: 21cm.